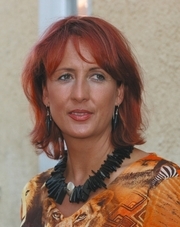 Corinne Hofmann is a Swiss author most famous for her multi-million selling memoir Die weisse Massai (The White Masai). Born on June 4, 1960 to German father and French mother, Corinne studied in the canton of Glarus and eventually went into the retail trade. At the age of twenty-one, she opened her own clothing store. In 1986, Hofmann and her fiancé Marco made a trip to Kenya. There, she met a Samburu warrior named Lketinga and instantly found him irresistible. She left Marco, went back to Switzerland to sell her possessions, and returned to Kenya, determined to find Lketinga, which she eventually did. The couple moved in together, married, and had a daughter. The Samburu are a pastoralist people related to the Masai, and live in small villages in an arid area of central Kenya. Hofman moved into her mother-in-law's manyatta (compound) and learned to live as a Samburu woman, fetching wood and water. She opened a small shop in the village, to sell basic goods. Hofmann suffered several hardships, including diseases (mainly malaria) and marital problems. Increasingly paranoid jealousy from her husband, possibly a side effect of his addiction to the drug khat (miraa), severely damaged her relationship, and eventually she decided to return to Switzerland for good, taking her daughter with her. Later on, she wrote a book about her experiences. The book, titled Die weisse Massai, went on to become a phenomenal success. It has then been translated into several languages, and in 2005, made into a movie starring Nina Hoss and Jacky Ido. Hofmann has since written two other books, Zurück aus Afrika (Back from Africa) and Wiedersehen in Barsaloi (Reunion in Barsaloi), which are sequels of the first book. She returned to visit her Samburu family for the first time in 2004. Corinne Hofmann is currently considered a "single author." If one or more works are by a distinct, homonymous authors, go ahead and split the author. Corinne Hofmann is composed of 9 names. You can examine and separate out names.